HowardZinn.org sends a newsletter twice a year with news and updates related to Howard Zinn. Sign up below. 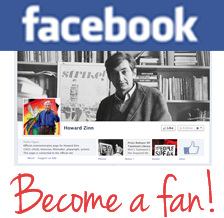 HowardZinn.org provides online access to articles, interviews, and other works by and about Howard Zinn. The website also offers a comprehensive list of books by Howard Zinn and announcements about events based on Zinn’s work. It is the official Howard Zinn website.